Heidi Swanson’s 101 Cookbooks is one of the few food blogs I read regularly: the writing is wonderful, the recipes are terrific, the photography is gorgeous. Even better, my sister and several friends read the blog, too; they often try out the recipes before I can get to them and report back with their results. 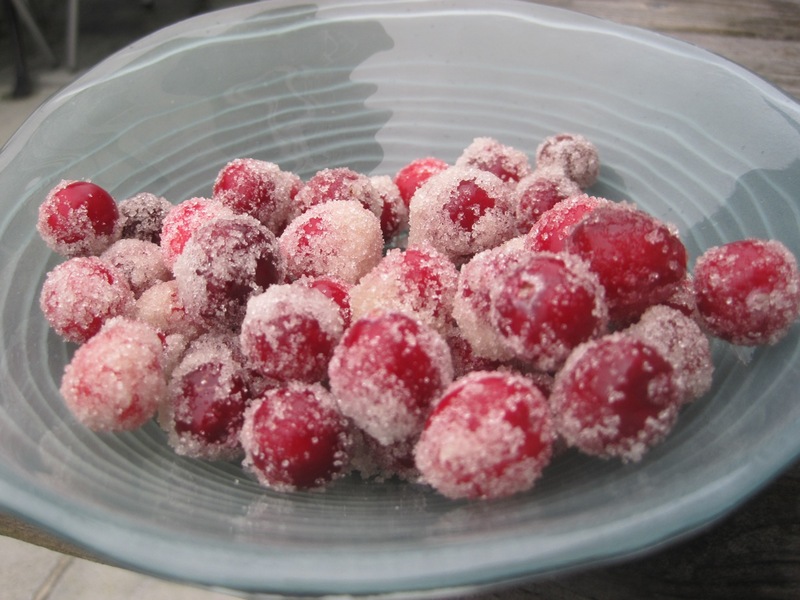 So it was with Swanson’s recipe for sugared cranberries, which my friend Julie made at Thanksgiving and let me taste; they hit just the right balance of sweet and tart, crunchy and soft. Ben and I both love cranberries, and we do eat cranberry sauce by the spoonful, but it’s nice to find another way to eat them. 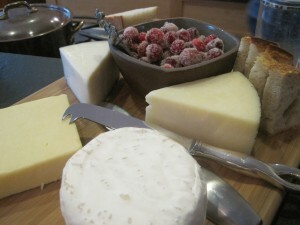 I made them for our New Year’s Day party, and served some on a cheese plate, while putting others with the cookies. We have just enough left over to toss a couple into a glass of champagne, and then to top tomorrow’s oatmeal — they are a very multipurpose snack! I used frozen berries, thawed briefly at room temperature on a jelly roll pan. I was short on time so I skipped the second tumble in sugar, and then used that leftover sugar (what didn’t stick on the cranberries) to make lemonade. The leftover simple syrup is in the fridge, awaiting the next round of cocktails. More sugar for coating: I do a mix of medium-grained organic sugar for the first coating, and then a second toss with regular granulated white sugar. You don’t want a huge grain for that first toss, just something larger than standard sugar, smaller than most turbinado sugars. The next day, drain the cranberries and toss them with larger grained sugar until they are well coated. I only use a scoop of sugar at a time, and small batches of cranberries, so the sugar doesn’t get too damp. Place the coated cranberries on a baking sheet to dry for a few hours. Makes 2 cups of sparkling cranberries. « Iced Ginger Cookies	» Food, and Family. Yet another reason I regret missing your party!